As we all know, after the glory days of the Three Men & A Baby/Police Academy/Coccoon days, our good friend Steve Guttenberg made a bit of a career switch into the children's film. But I digress. This is the second Steve Guttenberg soccer film in the project, suggesting a secret love of the game. Once again, we see unruly and rebellious children being tamed by a caring foreign accented teacher, soccer and Steve Guttenberg. Seriously, these movies are really similar. But this one's not Canadian, and therefore must be better. 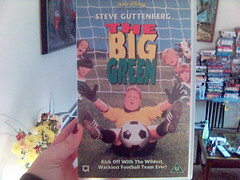 I give you 1995's The Big Green. We clearly realize we're looking at a quality film, because we have only one name above the title - Steve Guttenberg. Classic. 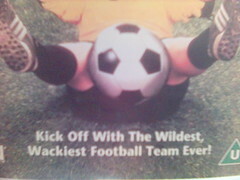 And this is clearly an ideal childrens' film, because not only is there a shot of a kid being hit in the crotch with a soccer ball, but it promises to be the "wildest, wackiest football team ever!" Well, I don't know about you, but I'm excited! Steve plays the sheriff in a small Texan town who, with the help of British teacher Olivia d'Abo gives the kids in his tiny town a reason to be proud of themselves, blah, blah, blah. Actually, it wasn't too bad. It opened with an animated goat sequence, so you know you can't go wrong. And Steve's accent wasn't too bad at all. I think this may be the first film where he's used an accent, other than the hideous New Zealeand accent in Don't Tell Her It's Me, which we're never thinking of again, thanks very much. Anyway, this one's not too bad. This is actually a pretty cute film. The kids are actually good - cute but not in a movie-puke-cute way, but in a real kid way. There's a bit of pre-teen romance which is adorable, an illegal immigrant B-plot which is a bit unexpected, and of course Steve's accent. You just can't go wrong. And people, there's an animated goat. Excellent! Hearing Steve Guttenberg's Texan accent: Priceless. Hey, nice info you have shared here, Great post and informative blog. it was awesome to read, thanks for sharing.